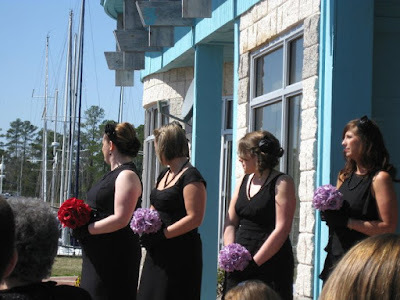 Back in March I was honored to be in a spectacular wedding. The theme was the 40s, and us girls had a blast dressing ourselves. We did a modern flip on things. 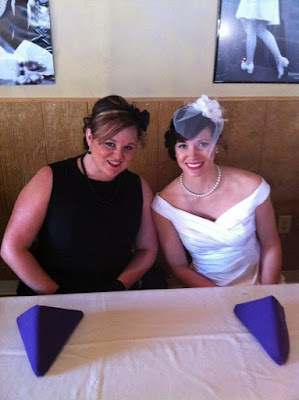 While the bride wore a beautiful white dress, with a family made birdcage veil and elegant pearls, we did a spin off of that, but in black. The easy part of it all was we didn't have to match 100% (here's a tip planning brides, things move smoothly when you set a theme, and let the girls roll with it). 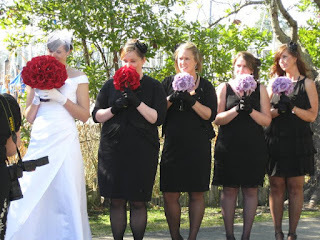 We all wore short black dresses, mary jane heals, black beaded necklaces with dangle black earrings. 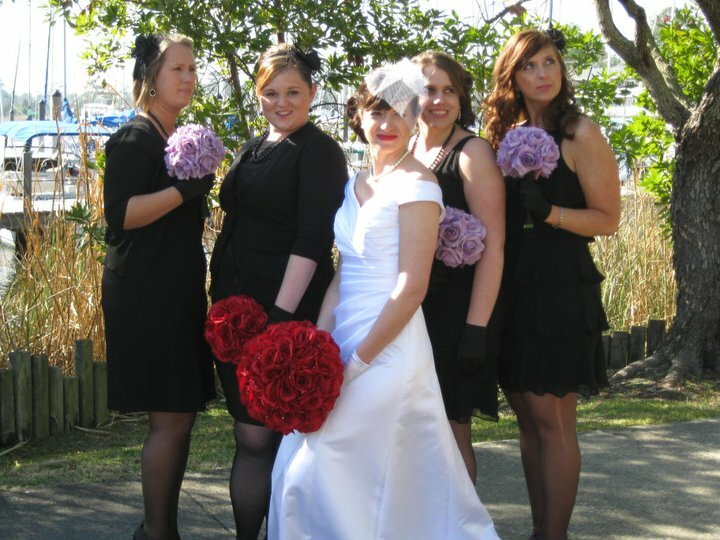 We wore black nylons with a seam down the back, short satin black glove, and different mini veil hair pieces in black. Our bouquets were beautiful if I do say so myself (ok shameless plug I made them all by hand as a wedding gift). We finished the look with a charcoal smokey eyes and statement red lips. Here are a few photos from the actual big day. Here we are watching the bride come down the isle. Hannah and I at the dinner table. We were just goofing around while the photographer got ready. 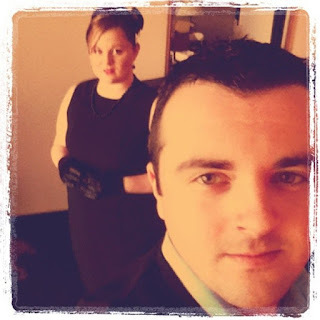 Before the wedding Eric and I posed all Mr & Mrs Smith like. 20 points if you know the editing app i used! All the pictures posted where just from family and friends, so please visit Catherine Alexander Photography for the professional photos here and here. They did a beautiful job, and we can't wait to work with them next month!